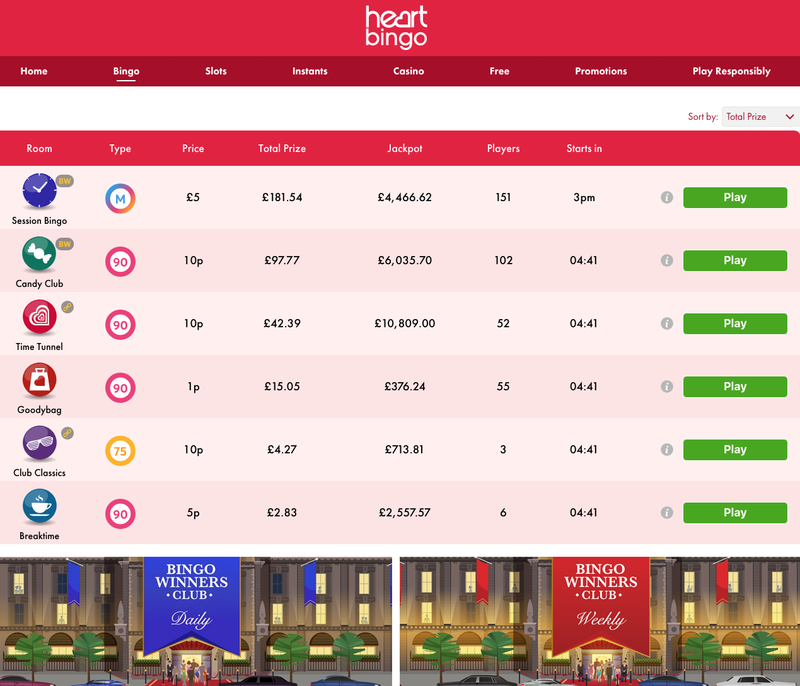 Heart FM has it's own online games site called Heart Bingo. The site launched in 2004 and runs on bingo software provided by Gamesys and Virtue Fusion. The company that owns and runs the site are Entertaining Play Ltd.
You will have to register before you can play at Heart Bingo but there's no software to download, you can just crack on playing as soon as you complete the quick and easy registration page. There's £5 free bonus when you join so play a few games on the house before you decide whether to deposit or not. If you do, you will get 200% cash match up to £100. Funding options on site include: Visa credit and debit card, Visa Electron, Mastercard, Maestro and Ukash. You have the option to play 80 and 90 ball bingo as well as a variety of slot games and a rather small instant game offering. You can play slots from just 1p per spin and bingo from 5p per ticket. There's also a free daily slot game for available called Doubly Bingo. The landing page is nice and bright with all its offers on display for you. Head to the lobby to find the games you wish to play. When I entered into one of the bingo rooms I was surprised to find a seemingly unmanned chat room, I was playing for a while and there was no sign of a Chat Host but this could have been a once off. The bingo player were a friendly bunch but I found it quite strange that there was no CH. If you need some help at any point, there's a very impressive Help section. You will find useful help topics and details of all the games on site such as how to play and how much it costs to play. I can't say I've ever seen that before. If you need to make contact with the support team you can do so via email or call them on their free-phone number. The promotions on site are pretty good you can enjoy BOGOF on bingo tickets, play the free slot Doubly Bubbly and take advantage of £10 bonus every time you refer a friend. Heart Bingo looks like a great site and admittedly there's a good range of slots but there's no wow factor to it. The games aren't particularly expensive to play but on the same hand, the prizes aren't all that impressive. You can listen to Heart whilst you play, which may be a plus point for some but I'd rather play somewhere that has a bit more wow factor to it. Having said that, there's a free fiver awaiting you if you fancy giving the site a go, so why not? Online bingo is one of the biggest markets on the internet, and one of the fastest growing, so it is no surprise that companies of various kinds are trying to get a piece of the highly profitable action. One of the first companies from another industry to make the move across to the online bingo was Heart FM, who launched Heart Bingo in 2012. Initially, this site was something of a token effort, although it found a fairly large customer base nonetheless. However, Heart Bingo has undergone something of a transformation in 2016 as an effort to gain some more attention and a wider customer base. So what has been the result of this makeover? Has Heart Bingo managed to make itself even more competitive? All the pieces are certainly in the right place, Heart is a much loved and trusted brand as a result of its radio programming, and has been no stranger to stepping foot into other industries. Add that to four years of experience in the industry and Heart Bingo is certainly in a position where it could make quite the splash, but will it? If you know anything of Heart as a brand, you are likely to know exactly what you’re going to be getting in terms of design here, but that is far from a bad thing. When your brand is as well-known as Heart is, it would be completely nonsensical to step away from the base design theme and create a bingo site that looked completely different. Clearly with this in mind, Heart Bingo has a red and white colour scheme, with the traditional Heart logo taking pride of place. The design is pretty minimal, which is very effective within the theme and creates a spacious feeling, a nice change from the often busy design concepts and colour schemes chosen by other bingo sites. A nice addition to the design here is a tab at the top that allows you to listen to Heart FM while you play, not only is this a pleasant addition if you are one who enjoys listening to music while you play bingo, it is also a sensible marketing strategy on the part of Heart FM, who can guarantee a far few extra listeners to their radio show through their bingo site. Basically, this is an excellent execution with a real sense of self-restraint. Heart knows where its strengths lie, and it is utilising them perfectly. For bingo lovers, who one would assume are the main focus here, there is a lot of choice on offer at Heart Bingo, in the shape of 90 ball bingo, 75 ball bingo, 80 ball bingo, and Super Snap. There is a downside, in that there are not many rooms to choose from, so you may not find a room that is perfect for you. On the other side of this though, the smaller amount of rooms mean that more people congregate in each, resulting in higher jackpots on offer. If you are not a bingo fan, or more likely, as this is a bingo site, if you are looking for a break or a change of pace for a while, then there is quite an impressive selection of slots here, especially for a bingo site. Starburst, Wonderland, Tiki Island, Paper Wins, Double Trouble, and Peggle are just a few of the slots that you can enjoy between bingo play. All in all, the new incarnation of Heart Bingo is a competitive, aesthetically pleasing, and well put together site that is well recommended for players of all standards and levels of experience.